The Consumer Electronics Show 2017 is just around the corner and Samsung will be one of the many companies present there to unveil new products. Samsung unveils new TVs at CES every year so there’s no reason to believe it won’t do the same in 2017. According to a new report, Samsung’s new smart TVs will eliminate the need to buy a streaming adapter because they’re apparently going to have Chromecast-like functionality built-in. 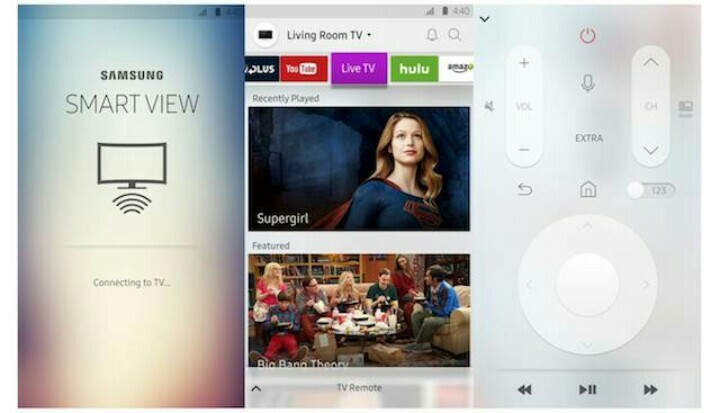 Samsung already has an app out called Smart View that enables smart TV owners to cast photos, videos, and music from their mobile devices to their TVs. The next iOS version of this app was apparently published ahead of time on the App Store and while the app description hasn’t been updated, the screenshots reveal that big new features are incoming. The app gets tabs for content from multiple streaming video services like YouTube, Hulu, and Amazon Prime Video. A live TV content tab is also present which lists shows watched recently alongside featured content and more. If these screenshots are any indication, it appears that users will be allowed to beam content from any of these sources mentioned in the app directly to their Samsung smart TVs. This will free up the phone which may also double as a remote control. Samsung has not yet commented on this report and with CES 2017 just a few days away it’s unlikely that the company will say anything about this now.